Travelon Toiletry Sheets Give You Some Hygiene In A TSA World: Just Add Water | OhGizmo! The best way to travel is light. No checked baggage means less time to get on your plane and less time leaving the airport at your destination. The only drawback is the TSA’s no fluids regulations that make it impossible to bring things like shampoo or shaving cream with you. You can always hope the hotel you’ll stay at has these, but you usually end up having to visit a convenience store and stock up. It’s stupid. 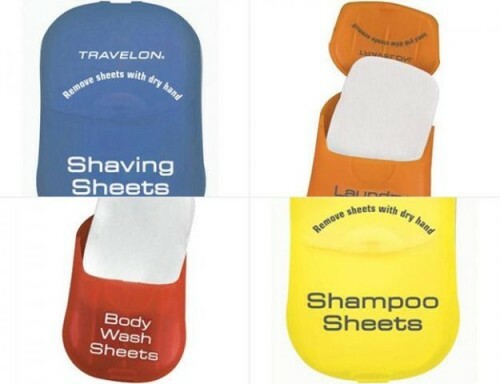 But these travel sheets from Travelon might offer an alternative. They’re dry and packed with different kinds of products that become usable once you add water at your destination. And they’re clearly not subject to 3-1-1. They’re not a new product, but it’s the first time I see them and will likely be placing an order. At $5 for 50 sheets of either body wash, conditioner, shampoo and a few others, it’s a steal.